The module was created by the mezzanine technology using DIC551 carrier boards and a set of MIC100x mezzanines. Functional capabilities of the module are determined by the installed mezzanines. DIC551 mezzanine carrier-board is implemented in the CompactPCI Serial 3U standard. The board is based on the FPGA with integrated PCIe x1 transceiver. PCIe x1 is a system interface for connection with other modules of CompactPCI Serial system for DIC551. The carrier board enables having two mezzanine boards installed on it and ensures availability of rear and front input of signals from mezzanine. The mezzanine is a functionally complete board that ensures analog and digital input-output. Mezzanine implementation doesn’t depend on the PC system bus used. The mezzanine communicates with the carrier-board using “simple” serial and parallel communication channels (SPI, SPORT, UART etc.). Interconnection of the “simple” communication channels and integration into the CompactPCI Serial standard system is carried out by the carrier-board. System developer can either select standard Fastwel mezzanines or develop its own mezzanine, which could be done relatively easy and fast. In this case, Fastwel experts undertake to manufacture DIC551 carrier-board and to develop drivers of the carrier for a set of operating systems. 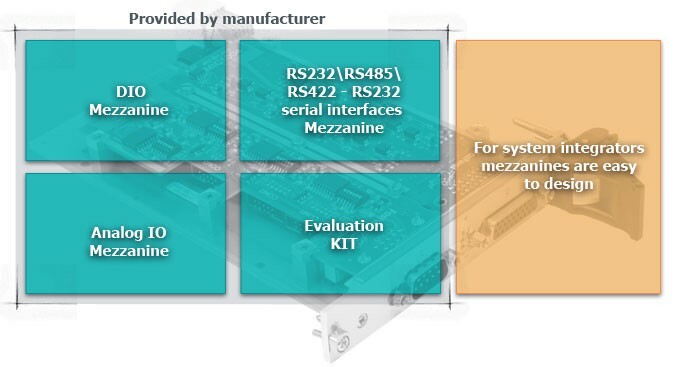 MIC1002 – Mezzanine of RS232\RS485\RS422 interfaces is designed for carrying out of I/O operations via 4x individually galvanically isolated serial port of RS232\RS485\RS422 type and represents a board for converting signal levels from the carrier-board located UART, into the signal levels of the relevant standards. MIC1003 – Digital I/O mezzanine, designed for input and output of 48 signals with CMOS logical levels. It is equipped with ESD protection. The mezzanine can be used for signal frequency measuring, receipt and transfer of serial code, conversion of codes, control of alphanumeric indicators, generation of time control charts. MIC1004 – Mezzanine of current loop interfaces is designed for carrying out I/O operations via 4x individually galvanically isolated serial ports of current loop type and represents a board for converting signal levels from the carrier-board located UART, into the levels of signals that meet the current loop standard.